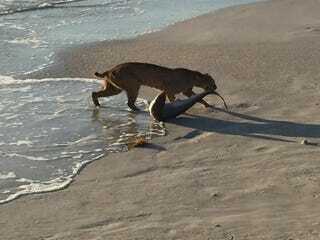 Earlier this week, a Florida resident was taking a stroll along Vero Beach in Florida's Sebastian Inlet State Park when he saw a bobcat staring at a shark that was feeding on smaller fish. But suddenly, the hunter became the hunted. As reported by ABC's Florida affiliate Local 10, the photograph was captured by John Bailey and has since been published at the Florida Fish and Wildlife Conservation Commission's Facebook page. Though some people are declaring the picture a fake, Liz Barraco, a spokesperson with the FWC, said they believe the photo is genuine and were "very excited to see it." David Hitzig, director of Busch Wildlife Sanctuary, told CBS 12 station that the incident is a real possibility, and that "Florida bobcats frequently hunt along local beaches to catch crabs and other animals all the time." Over at The Miami Herald, wildlife biologist Robert King was quoted as saying: "Would they go into the surf and pull out a shark? Darn right they would,” adding that, "Unless it’s been photo-shopped, I believe it." Speaking to Local 10, Bailey said he was so fascinated by the sight he didn't think about being in danger. When it happened, "it was pretty quick," adding that the Bobcat "spotted it, pulled it up [and] the shark floundered for a while." But when the big cat saw Bailey, it dropped the four-foot shark and retreated to the nearby forest. As for the shark — thought to be an Atlantic Sharpnose Shark — it managed to wriggle its way back to the ocean.